For Victor Body-Lawson of architect-and-planning firm Body Lawson Associates (BLA), designing and building the Hunts Point Peninsula is less like designing a building and more like building a village. “We think of it as building a community,” Body-Lawson says. The new affordable housing development—located in the South Bronx, New York City—seeks to do more than put a roof over peoples’ heads; it aims to promote their personal and economic well-being. The Peninsula will occupy the former site of the infamous Spofford Juvenile Detention Center, a place where there were 50 suicide attempts in one year alone, according to a report from Correctional Association of New York. Spofford’s appalling conditions made it unsuitable to rehabilitate children, as well as blight on the Hunts Point neighborhood. After a long battle, the Spofford facility was shuttered in 2011. Then in 2014, the nonprofit Sustainable South Bronx partnered with Autodesk to imagine alternatives to transform the site. This approach posits that affordable housing will work best if it tackles the issue within a larger context. Body-Lawson imagines integrating services to create a “nexus that makes the community a lot stronger”—addressing employment, health, and education simultaneously. “This will be a complete reinvention of the site, looking to grow South Bronx businesses and provide a new future,” Weisz says. Essential to WXY and BLA’s plan is forging partnerships with local institutions. Offering services that support residents of all ages and encourage healthy lifestyles, these businesses will serve as something like a jobs and economic development incubator for the entire neighborhood. Partners include Urban Health Plan, which will set up a clinic onsite; Super Fi Emporium, a supermarket offering better access to healthy foods; and South Bronx–based Spring Bank, providing affordable financial services. In addition, a local catering company and bakery will offer mentoring and job training, as will The Knowledge House, a technology education nonprofit. Maker fabrication labs will reflect the neighborhood’s industrial heritage with ultra-flexible spaces. There are precedents for the Peninsula’s mix of housing and social services. Via Verde, by Grimshaw Architects and Dattner Architects, also in the Bronx, is a much smaller affordable housing project that offers residents education and wellness programs. Stephanie Baez, vice president of public affairs at the NYC EDC, says the large lot size (5.3 acres) in Hunts Point has allowed her team’s project to offer a much wider array of local businesses and social services. Slotting these disparate organizations and businesses together, each with different spatial needs, was one of WXY and BLA’s biggest challenges. The industrial maker spaces need access to natural light; the bakery needs a kitchen closed off from public circulation; the bank needs a street frontage to bring in foot traffic, etc. “Each program is bespoke to a particular business or community facility,” he says. Together, these programs create a mosaic of institutions unique to the South Bronx. Body-Lawson says the Peninsula design is a “reverse panopticon”—meant to be the opposite of Spofford’s original layout, which had guard observation platforms looking outward to the wings of cellblocks. The new plan, designed using Autodesk AutoCAD and Revit, features an open courtyard at the center of the complex, so residents are looking into an “open center with Jane Jacobs’ ‘eyes on the street,’” he says. Surrounding this courtyard will be five midrise residential towers of 10 to 14 stories each, and all units in the complex will be subsidized at some level. In addition to funding from for-profit developers Gilbane Development Company, Hudson Companies, and the Mutual Housing Association New York, the project will be built using funds from a variety of tax credits and money from public agencies. Units will be divided among residents who make from 30 to 90 percent of the area median income, and the first phase of the project is to be completed in 2021. A low-rise community building sits nearest to the street, distinguished by its sawtooth roof, lined with solar panels and clerestory windows. It’s where many of the businesses and nonprofits will set up shop—most of which are local to the South Bronx. And that’s important because no one is parachuting in to “save” this largely Hispanic and poor section of New York City. “All of the program functions strengthen what’s already in the community,” says Body-Lawson. Weisz says the Peninsula plan is a concentrated version of what she often designs for entire neighborhoods. “This is a compressed version of many of the master plans we take on for districts and neighborhoods looking to address multiple stakeholders by creating places they all want to be,” Weisz says. The reasons for installing supportive social programming goes beyond the direct services they can offer. 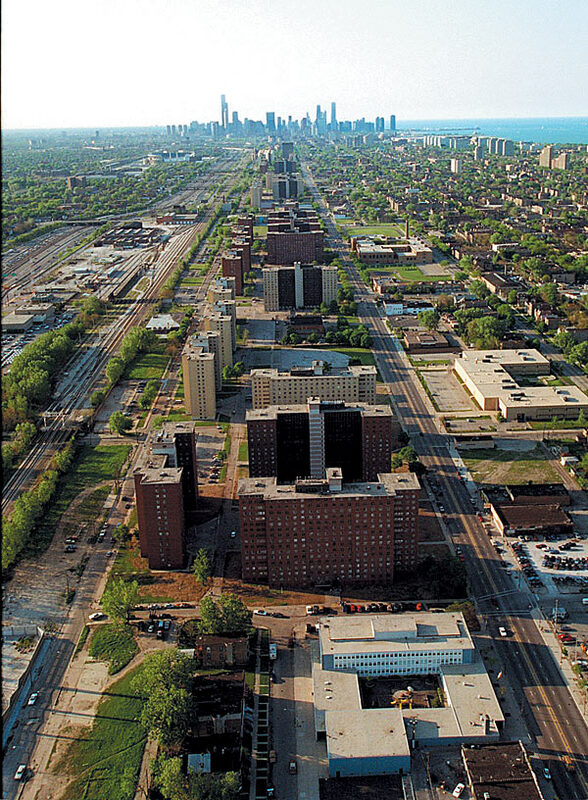 Failed high-rise public housing often lacked integrated business-and-service providers and offered few chances to meet and socialize with neighbors in a purely civic sphere. At the Peninsula, “the public realm is what pulls things together and makes space among industry, culture, play, and living,” Weisz says.